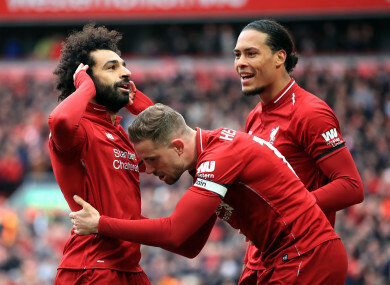 Mo Salah celebrates with Jordan Henderson and Virgil van Dijk. After a minute’s silence featuring mosaics reading “30 years” and “96″ held up by fans around the ground, Liverpool’s focus was trained on avenging one of the more painful defeats in the club’s recent history. Email “Mane and Salah on target against Chelsea as Liverpool keep title chase alive and kicking”. Feedback on “Mane and Salah on target against Chelsea as Liverpool keep title chase alive and kicking”.